This is heat treated CPM154. 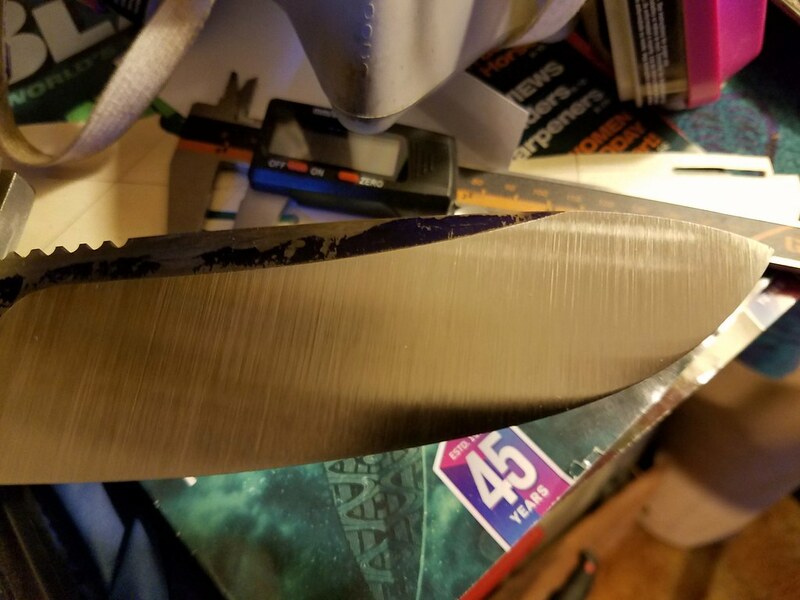 I'm using a KMG 2X72 to refine the bevels and experiencing grind imperfections occasionally as seen in this image. They are the exact same angle as the seams in my belts, so that is what is causing the impressions. What can I do to avoid this? It's driving me nuts and forcing me to go back to heavier grits to remove these. Is it due to applying too much pressure... or not enough, or possibly not using fresh belts? Belt speed or type of belt? I'm using Blaze Orange #80, then Hermes 120, 220, 400. Perhaps sweeping the blade across the belt faster would eliminate this? This is my 4th or 5th stock removal with the KMG and the first grind it's happening on. Puzzled. Notice the two horizontal ghost-like lines near the tip/spine. What's the most common cause? Last edited by rockhound; 07-19-2018 at 07:19 PM. I suspect it's technique. That looks very much like you "fell off" the edge of the platen. Lines such as that are typical when the grinding pass either falls off the bottom, or possibly the edge of the platen. Thanks for the response Ed. I appreciate the advice, but not quite sure what you mean by "fell off" the edge or bottom of the platen. I work near the 50-60% height of the platen (glass platen) so I don't think it involves the bottom of the platen.